A: : For the tightening torque, refer to TM-508, "Removal and Installation". Never open the radiator cap or drain plug when the engine is hot. Hot liquid may spray out, causing serious injury. • When replacing the TCM and transaxle assembly as a set, replace the transaxle assembly first and then replace the TCM. Refer to TM-374, "Description". • Cap or plug openings to prevent fluid from spilling. 1. Remove the battery. Refer to PG-124, "Exploded View". 2. Remove the air cleaner case. Refer to EM-161, "Removal and Installation". 3. Remove the ECM and bracket as a set. 4. Disconnect the connectors and harnesses. • For CVT unit connector, refer to TM-311, "Removal and Installation Procedure for CVT Unit Connector". 5. Disconnect the control cable from the transaxle assembly. Refer to TM-485, "Removal and Installation". 6. Remove the water hose from the engine side. TM-500, "Removal and Installation". Coolant leaks out. Use a cap, plug, or other means to prevent leakage. 7. Remove starter motor. Refer to STR-22, "HR16DE : Removal and Installation". 8. Remove the left and right fender protector. Refer to EXT-22, "Removal and Installation". 9. Rotate the crankshaft and remove the nuts that secure the drive plate to the torque converter from the stator motor mount. 10. Remove the left and right drive shafts. Refer to FAX-53, "Removal and Installation". 11. Remove the front suspention member. Refer to FSU-18, "Removal and Installation". 12. Remove the heat insulator. Refer to EX-12, "Exploded View". 13. Set a transmission jack under the transaxle assembly. Be careful not to contact the drain plug when setting the transmission jack. 14. Set a transmission jack under the engine assembly. 15. Remove the left engine mounting insulator and left engine mounting bracket as a set. Refer to EM-215, "Exploded View". 16. Remove the bolts that fasten the transaxle assembly and engine assembly. 17. Remove the transaxle assembly from the vehicle. Never drop the torque converter. • Apply Vaseline to the O-ring. • When using drive plate location guide, install drive plate location guide (Commercial service tool: 31197EU50A) (A) to drive plate location guide mounting part of torque converter. • Rotate the crankshaft so that the drive plate location guide insert hole (A) of the drive plate is aligned with the drive plate location guide that is installed on the torque converter. • Rotate the crankshaft clockwise (as viewed from the front of the engine). • Be careful that torque converter stud bolt is aligned to drive plate hole position. Otherwise stud bolt contacts drive plate. • Temporally tighten drive plate and torque converter connecting nuts and tighten to the specified torque. • Rotate crankshaft clockwise (as viewed from the front of the engine). • Check the tightening torque for the crankshaft pulley mounting bolts after the bolts fastening the drive plate and torque converter have been tightened and the crankshaft pulley mounting bolts have been secured. Refer to EM-182, "Removal and Installation". • Install the transaxle assembly and engine assembly mounting bolts according to the following standards. Check the distance “A”between the converter housing and torque converter. 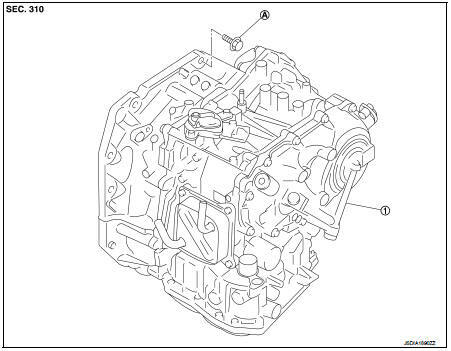 Dimension “A” : TM-513, "Torque Converter"
Check the following items: • CVT fluid leakage. Refer to TM-480, "Inspection" • For CVT position, refer to TM-383, "Inspection and Adjustment". • Start the engine and check for coolant leakage from the parts which are removed and reinstalled. • Adjust the CVT fluid level. TM-379, "Adjustment". • Perform "ADDITIONAL SERVICE WHEN REPLACE TRANSAXLE ASSEMBLY". Refer to TM-375, "Description".